It’s a chore, isn’t it? Sometimes it feels that way. BUT, it doesn’t have to be! Make it simple. Keep it easy, and have fun. KEY: invest in the right tools to get the job done! 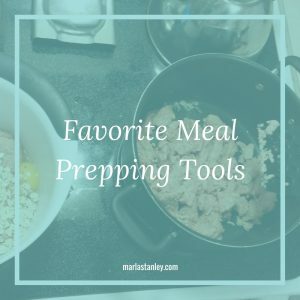 Here are my favorite meal prepping tools and resources for you to check out. If you haven’t yet, go check out my Meal Planning Cheat Sheet to get started planning a week of meals with what you have already on-hand to work with! PS-it’s FREE! For Veggies-When preparing veggies for even just a few days in your fridge, you want to keep them fresh and crisp. Not gonna happen just throwing them in the drawers, friend! Let me help you save some hard-earned cash by sharing this with you. For meals-These are not going to cost you more than you would pay for a meal out, and they are quite durable. We personally use these containers and they are the perfect size for a full dinner portion, or if you are packing a lunchable/protein box style meal. So, if you want the lighter option these are BPA free, microwave, dishwasher, and freezer safe. You can’t beat the price for that! And, the super fun, super healthy, super HEAVY glass option. Perk-you can bake in these as they are oven-safe (also freezer, dishwasher, etc). Down-they are heavy. They DO have snap-locking lids and a cutlery compartment, AND they stack! So, so efficient. If you truly want best economical and health option, this is what you want to invest in. Lids for jars?? Yes! These, and other “jar” products are amazing for food prepping. Whether you want a green smoothie lid, BNTO drop-in for your salad in a jar, or a MAson Tap Infuser Cap, they have it all. Packaging that is healthy, safe, and fun is the name of the game. Check out Cuppow and click their “shop” link for all the options! Mason Jars-great for smoothies, drinks on the go, or just having some water. Here are some good deals on Pint or Quart sizes! We use both! Ooohhh, vintage purple anyone? Drooling over these-I have to stop myself from buying more and more every year! Lids-don’t forget your regular lids. These are AMAZING for storing the rest of your sauce, leftover tea, prepped salads, or even soups in the fridge. Have a bunch of these on hand to top a jar of jelly, apple butter, etc. If you have seen my posts and videos, you know I have a love affair with the DeMarle Bon Cook products. I was introduced by my friend Julie, who has a lovely business with DeMarle. You can check out all her amazing goods here. You’ll never want to use a standard muffin pan, cookie sheet, or baking dish again! Seriously, you’ll thank me. PS-don’t miss the bonus lessons that come with the Meal Planning Cheat Sheet to help you cover the basics of planning, prepping, and choosing quality meals for yourself and your family!